Noninvasive image-guided breast brachytherapy (NIBB) is a novel approach to deliver accelerated partial breast irradiation (APBI). 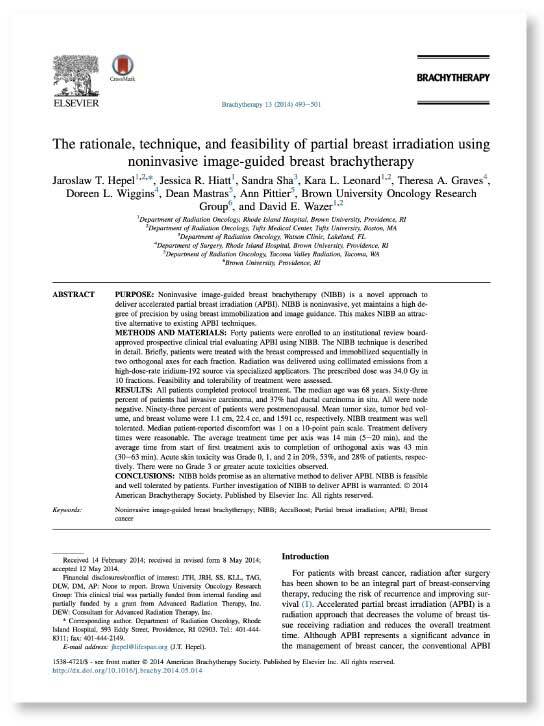 NIBB is noninvasive, yet maintains a high degree of precision by using breast immobilization and image guidance. This makes NIBB an attractive alternative to existing APBI techniques. Forty patients were enrolled to an institutional review board- approved prospective clinical trial evaluating APBI using NIBB. The NIBB technique is described in detail. Briefly, patients were treated with the breast compressed and immobilized sequentially in two orthogonal axes for each fraction. Radiation was delivered using collimated emissions from a high-dose-rate iridium-192 source via specialized applicators. The prescribed dose was 34.0 Gy in 10 fractions. Feasibility and tolerability of treatment were assessed. All patients completed protocol treatment. The median age was 68 years. Sixty-three percent of patients had invasive carcinoma, and 37% had ductal carcinoma in situ. All were node negative. Ninety-three percent of patients were postmenopausal. Mean tumor size, tumor bed volume, and breast volume were 1.1 cm, 22.4 cc, and 1591 cc, respectively. NIBB treatment was well tolerated. Median patient-reported discomfort was 1 on a 10-point pain scale. Treatment delivery times were reasonable. The average treatment time per axis was 14 min (5e20 min), and the average time from start of first treatment axis to completion of orthogonal axis was 43 min (30e63 min). Acute skin toxicity was Grade 0, 1, and 2 in 20%, 53%, and 28% of patients, respectively. There were no Grade 3 or greater acute toxicities observed. NIBB holds promise as an alternative method to deliver APBI. NIBB is feasible and well tolerated by patients. Further investigation of NIBB to deliver APBI is warranted. © 2014 American Brachytherapy Society. Published by Elsevier Inc. All rights reserved.